As concrete is stronger, but has poor tensile strength, so different sorts of scaffolding are made to mold this early structure for the future shape. Formwork refers to the panels and false work that creates a mold in which concrete can be poured for setting. 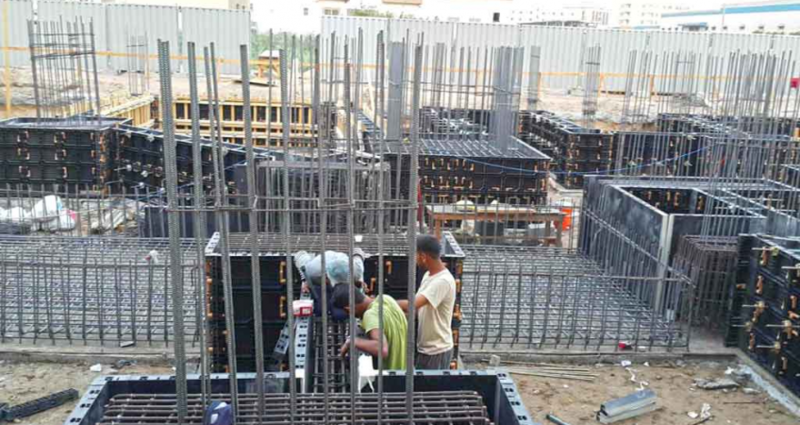 A suspended concrete slabs are not directly supported by the ground, where this slab-formwork is used to create the structure. It includes formwork’s panel, joists, stringers and other supports, which permit the concrete to be poured and suspended above the ground. In this method the stringers and joists are replaced with engineered wood beams and supports are replaced with metal properties. It makes this technology more systematic and recyclable. This procedure comprises of support out of timber or young tree trunks, which bolster rows of stringers amassed about 3 to 6 feet or 1 to 2 meters separated, depending upon thickness of slab. Between these stringers, joists are situated around 12 inches; 30 centimeters separated whereupon boards or plywood are set. The stringers and joists are typically 4 by 4 inches or 4 by 6 inches lumber. In these techniques, stringers and joist are supplanted with aluminum shaping frameworks or steel pillars and supports are supplanted with metal properties. It makes this technique more deliberate and reusable. Aluminum beams are made-up as extendable units that permit them to span supports that are situated at different distances apart. Extendable aluminum beams can be utilized and reused as a part of the development of structures of variable size. These frameworks comprise of pre-assembled timber, steel or aluminum beams and formwork modules. Modules are regularly no bigger than 3 to 6 feet or 1 to 2 meters in size. The beams and Formwork is commonly set by hand and stuck, clipped, or screwed together. It doesn’t need any crane to put the formworks. It doesn’t need skillful labors. It can be removed after the concrete sets leaving just pillars set up before accomplishing design strength. It should support the weight of concrete during placing and compacting. It should be easily created and struck. It must be stable in all weathers. It can be handled safely and can easily use available equipment. The connections between members are sound enough to prevent grout leakage.